A 40 year old man presents with near syncopal events and has low oxygen saturations in the emergency department, on a past history of systemic hypertension. His blood pressure is low-normal and the chest X ray is clear, so he goes on to have an urgent CTPA which shows bilateral PE with a large burden of clot in both the left and right main pulmonary artery. Low dose thrombolysis is considered to minimise the risk of long term pulmonary hypertension. The patient is transferred to ICU and an urgent echo is performed to assess the right ventricle. Here are the first loops, can you spot any subtle pathology on these initial scans? 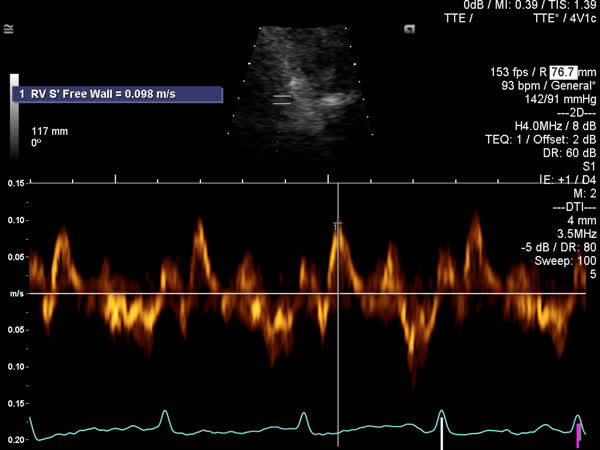 Parasternal long axis view: The left ventricular function appears preserved, but the LV walls might be somewhat thickened (Normal thickness <1.2cm). 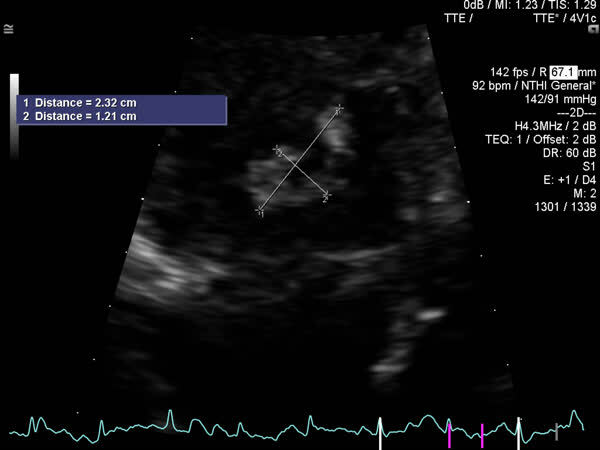 Note also the RV appears a bit dilated – as a rough guide, the RV should appear to be approximately the same diameter as the aorta and the LA in this window. The right ventricle drapes around the LV. In response to an acute Pulmonary Embolus (PE) it first dilates. The RV can’t generate much force without training, so when the Pulmonary Vascular Resistance (PVR) first rises with a PE, the pulmonary artery pressures don’t actually rise substantially because the RV can’t generate large pressures. 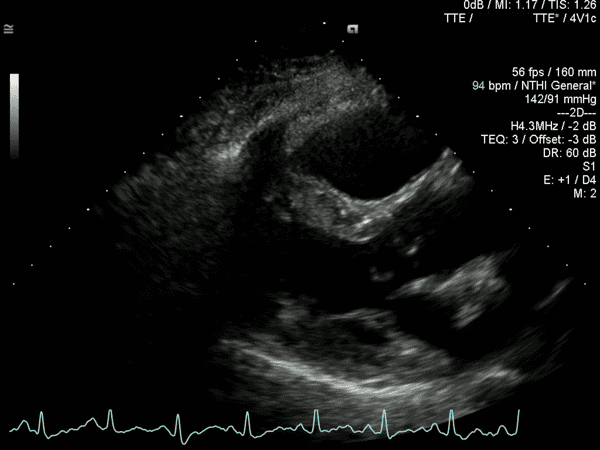 Looking at the ventricle in short axis, the septum may bow towards the LV which will form a D shape in diastole, producing a “volume overloaded right ventricle” appearance. Only later when the RV has been trained will it be able to generate higher pressures. If the LV is D shaped in systole, this is a “pressure overloaded right ventricle”. Acute cor pulmonale with both pressure AND volume overload (D shape in systole AND diastole) is often absent. 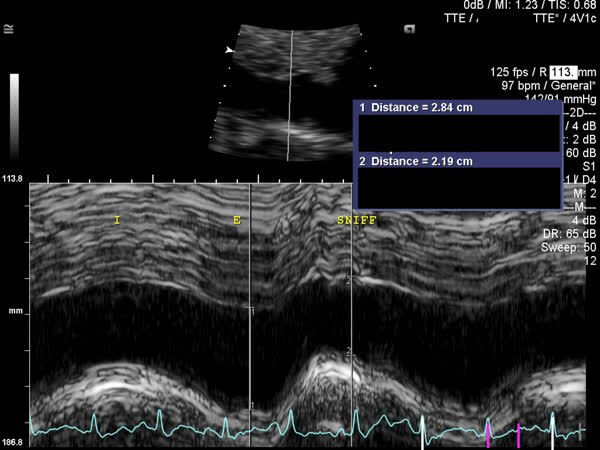 Notching of RVOT flow, which may represent dicrotic notch of elevated pulmonary vascular resistance or intermittent obstruction of flow through the pulmonary arteries from thrombus. Note that the RV ejection acceleration time is <60ms. The combination of this with a TR gradient of <60 mmHg has been referred to as the 60/60 sign, and has a sensitivity of 25% but a specificity of 94% for acute pulmonary embolism. 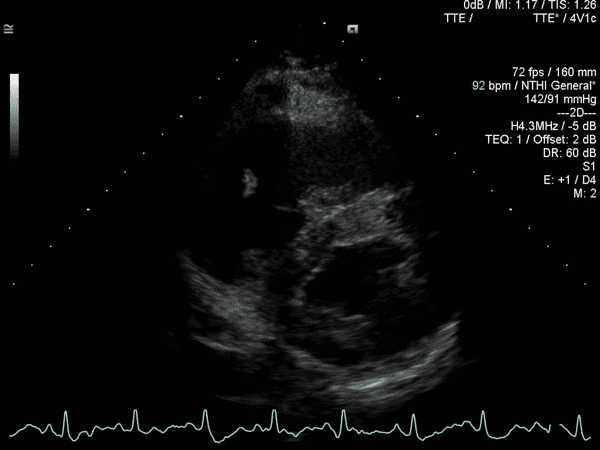 What is going on with the right ventricle here? Do you know what McConnell’s sign is? 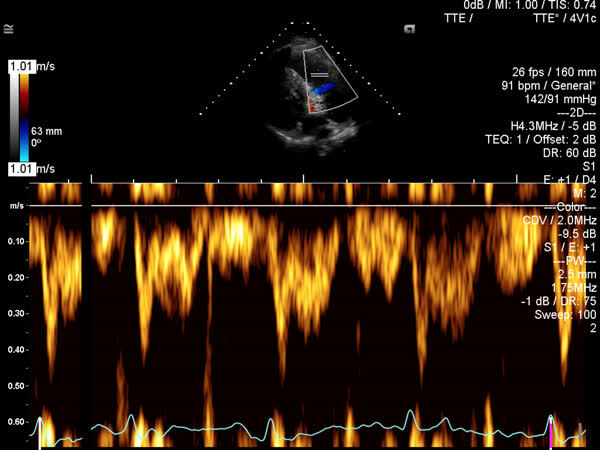 McConnell’s sign is the winking RV, when under strain the RV apical function appears preserved in contrast to the RV mid free wall which is akinetic (postulated to be secondary to free wall ischaemia). In the appropriate population McConnell’s sign has a low sensitivity (19%) but high specificity (100%) for diagnosing PE. Can we make a quantitative assessment of RV function? On the other hand, RV S’ is normal (>9.5cm/s). This isolated finding is not consistent with the 2D image where the RV function appears reduced. 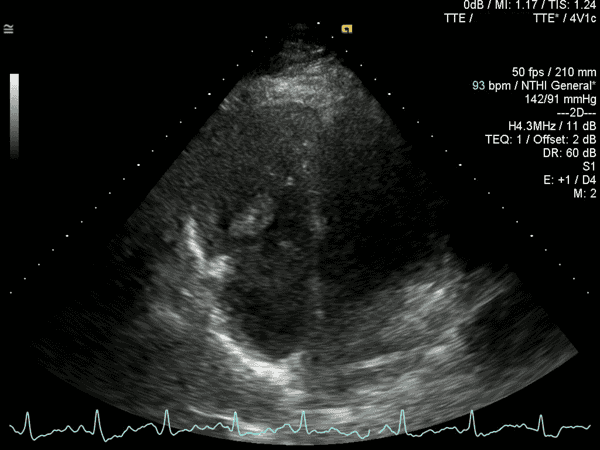 Zoomed view of thrombus in transit, appears caught in the subvalvular apparatus of the tricuspid valve. 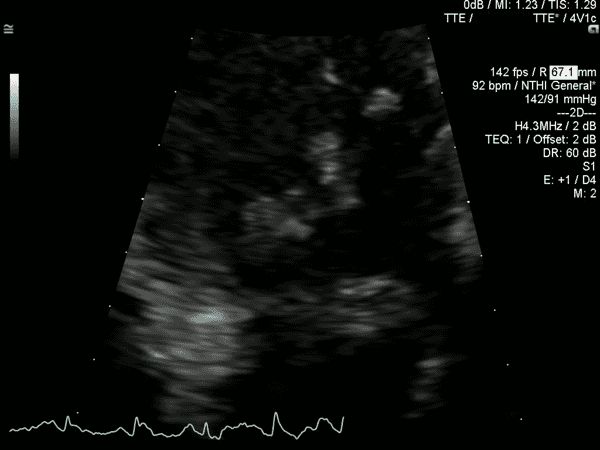 It is uncommon to see thrombus in transit (1-4%); more commonly, indirect features of increased RV afterload are seen. In the non-intubated patient, how does IVC size correlate with CVP? IVC diameter <2.1cm that collapses >50% with a sniff suggests normal RA pressure of 3 mmHg (range, 0-5 mmHg). IVC diameter >2.1cm that collapses <50% with a sniff suggests high RA pressure of 15 mmHg (range, 10-20 mmHg). If IVC diameter and collapse do not fit this paradigm, an intermediate value of 8 mmHg (range, 5-10 mmHg) may be used. Note, this is in the spontaneously breathing, non-intubated patient. Heparin was continued at a therapeutic range. Discussion with cardiac surgeons and radiology regarding clot extraction. Kurzyna, M., Torbicki, A., Pruszczyk, P., Burakowska, B., Fijałkowska, A., Kober, J., et al. (2002). 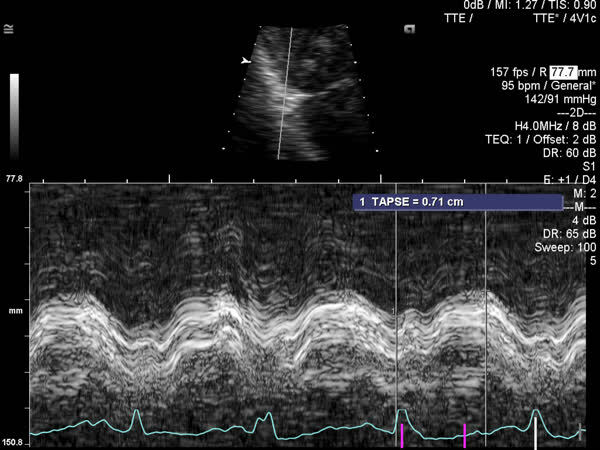 Disturbed right ventricular ejection pattern as a new Doppler echocardiographic sign of acute pulmonary embolism. The American Journal of Cardiology, 90(5), 507–511. It’s a good thought but I think you are right and it is just artifact (…with the benefit of a complete study including a bubble study and serial follow up TTE to be sure). However, this is exactly the circumstance where systemic embolisation might occur (if there was a PFO or atrial septal defect) with elevated right sided pressures predisposing to right to left shunting, and a large clot burden to embolise. We certainly spent a lot of time looking at the interatrial septum and doing a good bubble study!